Description: Smith & Wesson Model SW1911 Pro Series Semi-Auto Pistol serial #UCW9223, 45 ACP, 3" barrel with an excellent bore. This Airweight subcompact pistol retains about 99% original blue and anodized finishes with minor handling wear. The stippled synthetic replacement "Ergo Grips" rate very good plus with scattered lightly compressed raised points. The pistol features Novak style three dot sights, beavertail grip safety, extended thumb safety and coned bushingless barrel. It includes a factory hard case that is correctly end labeled and numbered to the gun, a pair of magazines, a spare pair of recoil springs, fired case, manual and paperwork. 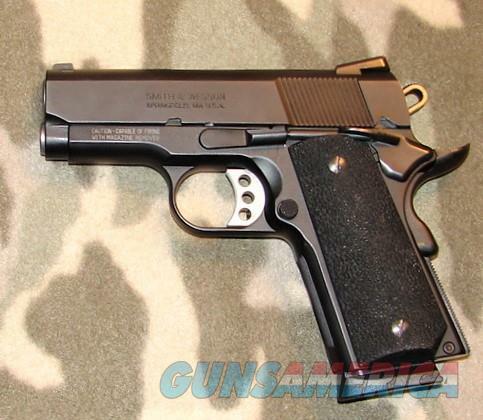 This should be a great carry gun for the 1911 aficionado.